accounts and more important, show kids the necessity of saving money for the future. We created a team with planners, art directors, UX and UI designers and developers. To better understand we entered the client universe with a series of internal interviews and learned from CAIXA Savings Accounts data. The research focus was on understanding client behavior and defining personas. The main personas were defined as kids and teenagers. While the center of the campaign was digital, we decided that traditional media would lead to a landing page where users could download a game on all mobile platforms. To create the Poupançudos Soccer Stars we put brazilian kids' two favorite things together: soccer and cartoons. These adorable characters wear the jerseys of the biggest soccer squads in Brazil sponsored by Caixa, and they teach kids about minding their money. More than 300 thousand visits on the landing page per month. 40 million people reached on Facebook. 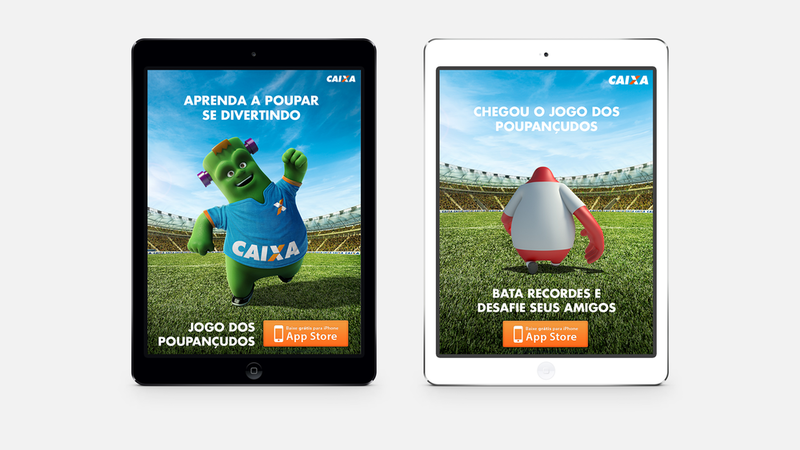 20% more fans on Caixa’s fanpage, and the game was downloaded more than 100 thousand times on several mobile platforms. Creative Direction, Creative Strategy, Art Direction.